I don't know when my love for exploration became a preference in game mechanics, but I think Archipelago might be at fault. Back in 2014 when I first played that Euro-style game about imperialism, I found the exploration mechanic quite energizing. It was risky and therefore invigorating to place a precious action disk on the "Explore" area of the rondel and take a chance on whether the available land/water hex would fit into my area. I probably enjoyed that Exploration option a bit too much, spending resources on exploration because it's fun to gamble and open up new opportunities in the game. When Sisters & Spirits was barely a seed idea in my mind, I realized that the haunted house which serves as the location of the game needed to offer players a similar thrill of exploration. What if players could build the house together? Exploration taps into the curiosity that drives humans to learn, grow, and discover. Have you ever found yourself paging through old magazines looking for crazy advertisements (so much aspic! Ew! ), or poking through a yard sale because there might be a great find just under the next pile? Exploration is addictive for the same reason gambling can be addictive: it can feel so good to take a risk and be rewarded. Or maybe discovery simply offers a way out of boredom. Games can use a discovery mechanism to give players true agency over their pathway through a game. Rather than handing the player a fixed board, the designer can give players pieces plus an incentive to create new areas as the game unfolds. 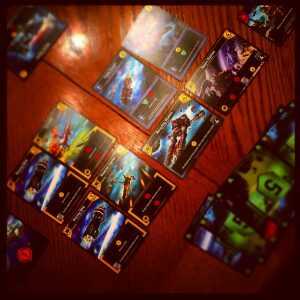 One of my favorite deck-builders is Star Realms. Two (or more) players face off with a basic hand to purchase ships and starbase cards from a trade row in the center of the table. Five ships or bases are available at a time, and players must decide how to build their decks based on whatever's available for sale on their turn. The strategy decisions include maximizing your own strengths while possibly playing "keep away" by purchasing ships to interrupt your opponent's strategy. I find it just as thrilling to "discover" the next ship from the deck in Star Realms as to flip over a new tile in Archipelago. Both games give me a choice from among randomly available options. And the risk-reward element keeps me intrigued. Thus far, we've been using Exploration as a key game mechanic in Sisters & Spirits (read more here). In fact, the entire first phase of the game depends on it. Starting out, players work together to build at least one full pathway from the center of the haunted house (an area we call the "Mausoleum," in the basement") outward and upstairs until one side chooses to lay down an Exit Door. At that moment, play shifts toward "tower defense" and the game moves on. 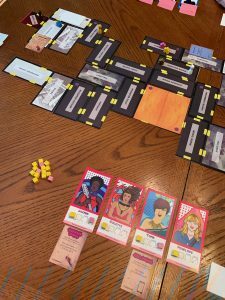 A recent play-test of Sisters & Spirits, showing the orange Mausoleum and the basement / upstairs rooms that players build cooperatively before they started racing toward the doors. In our play-tests, the "build the house" phase intrigues players. Both sides need viable escape routes (the Sisters want to get out of the house before the ghosts possess them; the Spirits are trying to trap and possess the girls so they can escape the house via human form). Therefore, both sides have an incentive to work together and not simply trap the girls in the house. 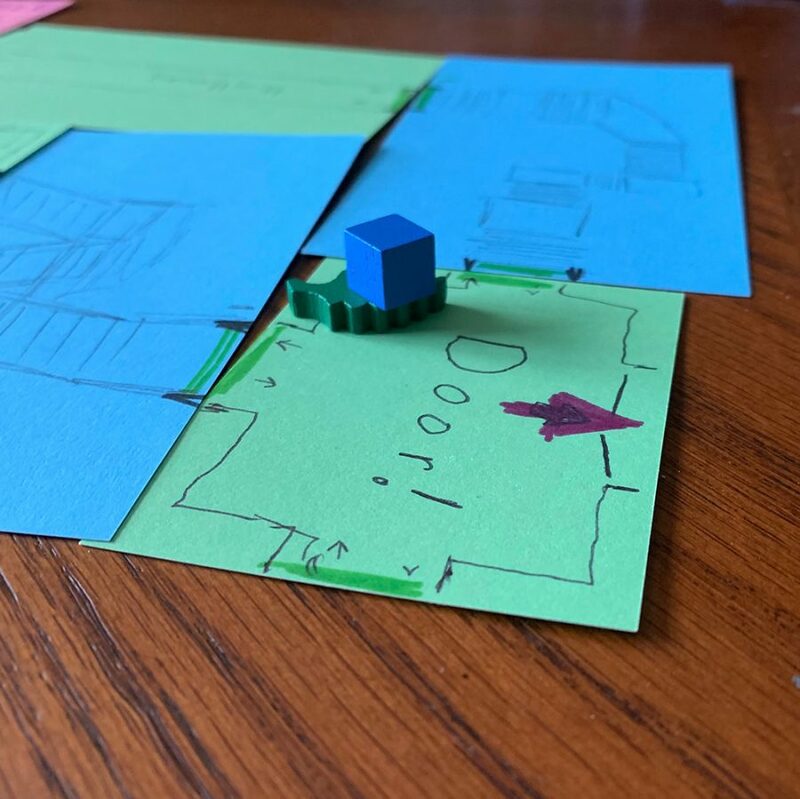 In this photo from a recent play-test session, the players build a rather "tight" grid of rooms featuring multiple pathways toward the upstairs exit doors. Fitting together the rooms (doorways have to line up) creates a physical placement puzzle, almost like a mini-game. Each side wants to optimize their routes differently -- the Sisters want a short route but lots of rooms (because they can pick up hidden treasures and power-ups along the way) and the Spirits want to delay the girls' route through the house, tower-defense-style. We've seen the gleam in the eyes of players as they realize how they could play a room card just to make the other side's life a little harder, before realizing it'll cost them something too. We know we have a lot of work yet to do on this game, but the "build the house" exploration mechanic remains something I'm most proud of. In the fiction of the game, we posit that the girls wandered through the house a bit as they entered, and that's the pathway that players are creating together in the first phase of the game. After that, all bets are off! Posted in Development Diary and tagged mechanics, SistersAndSpirits.